Posted September 19th, 2018 & filed under England Carrier Services. If Brake Safety Week has shed some light on necessary maintenance, England Carrier Services (ECS) is here to help. With the ECS maintenance program, you can save money on services that will help to prevent violations and get you to your destination safely. Please call 888-881-9087 to learn about customized solutions for your needs. The Commercial Vehicle Safety Alliance’s annual Brake Safety Week is in full swing. To create safer roads, CVSA-certified personnel have been conducting roadside inspections on commercial motor vehicles in order to identify and remove all commercial motor vehicles (CMVs) with critical brake violations. Inspectors will primarily conduct North American Standard Level I inspections. This is a 37-step procedure that includes an examination of driver operating requirements and vehicle mechanical fitness. Inspectors will be looking for loose or missing parts, air or hydraulic fluid leaks, defective rotor conditions and other warning signs of possible brake system failures. 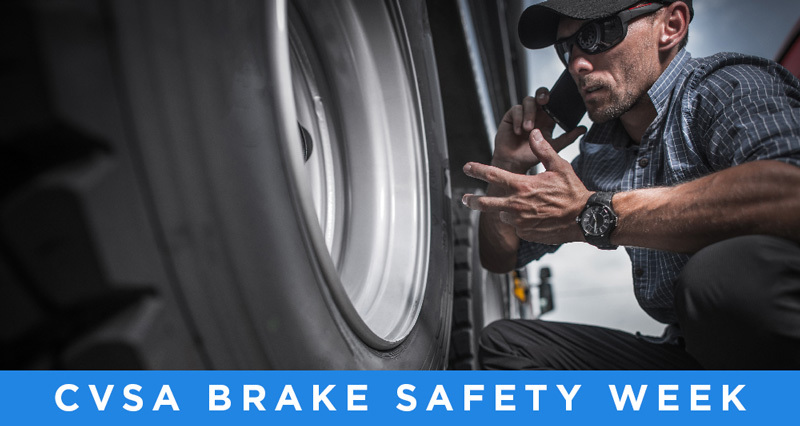 According to the Federal Motor Carrier Safety Administration’s (FMCSA’s) Large Truck Crash Causation Study, 32.7% of large trucks with pre-crash violations had brake problems. The study also found that trucks involved in brake-critical crashes, 45.5% had brake violations. That is compared to the 29.9% of trucks involved in crashes of the same type where braking was not relevant. During CVSA’s 2017 International Roadcheck, brake violations comprised the largest percentage of out-of-service vehicle violations. Properly functioning brake systems are crucial to ensure safe CMV operation throughout the life of the vehicle. Brake systems should be routinely and carefully maintained to remain safe and efficient. Properly maintaining your brake system will not only help you save money. Most importantly it will keep you and other drivers safe on the roads. The England Carrier Services (ECS) division offers a variety of services for carriers ranging from maintenance to support. As ECS members, carriers have access to nationwide discounts on fuel and tires from dedicated team members who are committed to finding the best price. ECS also provides factoring services with benefits such as same-day funding to a bank account or fuel card. These options allow carriers the freedom to focus on growing their business while saving time and money.